Our bag tags are a handsome way to identify your golf club bag. 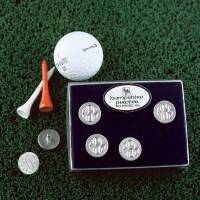 The design includes a 3-D male golfer icon on the fine pewter tag. The engraving of the golfer's first and last name are included. This makes a terrific gift for the golfer in your life.